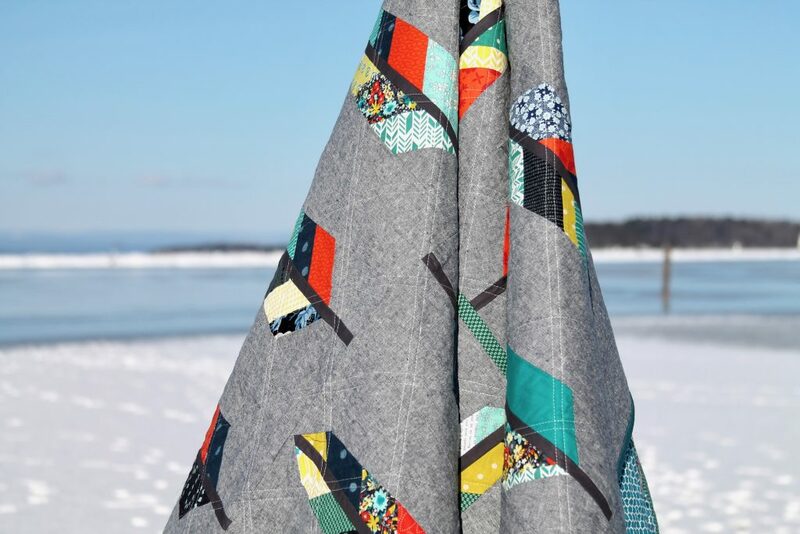 I don’t typically make quilts following patterns. Something to do, perhaps, with my inability to show up prepared? I like to procrastinate, to kind of just hope that things will work out, so reading through a quilt pattern with lists of needed items and all those pieces to cut ahead of time always puts me off. I prefer to hope I’ll have enough fabric rather than measuring, to hope that when I put the pieces together I’ll end up with something I like. Maybe not knowing the outcome keeps it interesting? Or perhaps I secretly enjoy having to improvise when I nearly always end up running out of a key fabric. I have a feeling I could learn a few tricks and shortcuts by following patterns, but being stubborn, I insist on figuring it out on my own (and often taking a convoluted route to get there). Perhaps there’s a lesson to be learned here? I was going to tell you that the colors were based on that great Liberty of London floral, but I just now read through my old posts about this quilt and discovered that was not the case. 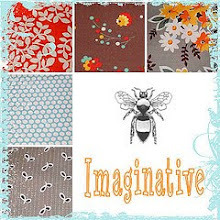 I’m not sure how the color scheme came about then, as these colors are not my usual picks — something I found myself thinking as I was quilting it! I decided to quilt it with double straight lines on the diagonal. 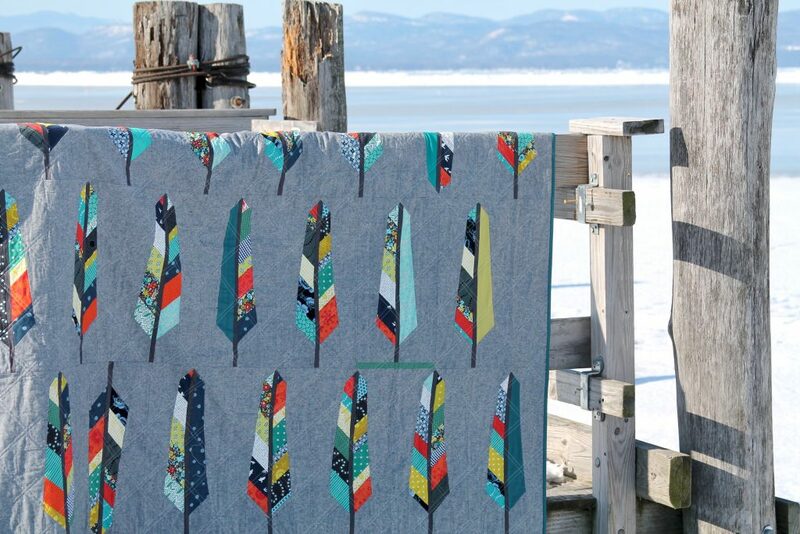 I wish there was a faster way to quilt double straight lines… I love the look, but hate that it takes twice as long! So despite my love of ice photos (here, here and here and here on solid ice), I opted for ‘in front of the ice’ photos for this one. 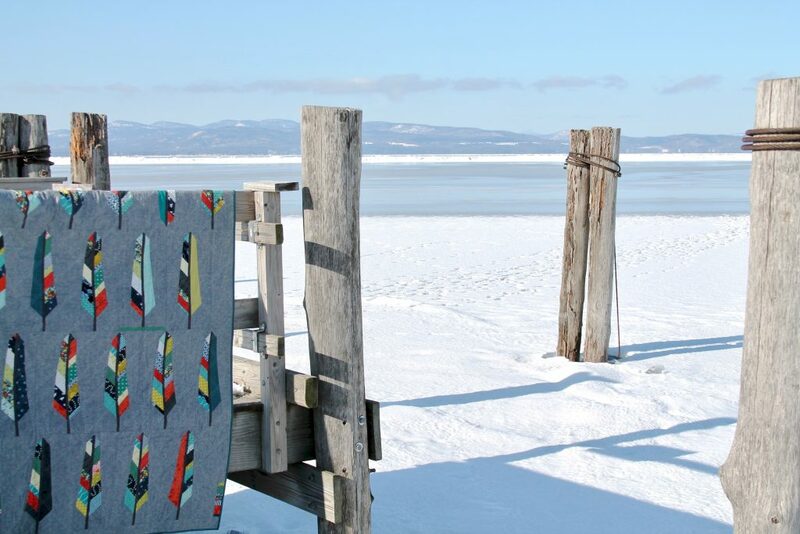 No one wants to fall into ice cold lake water in February. 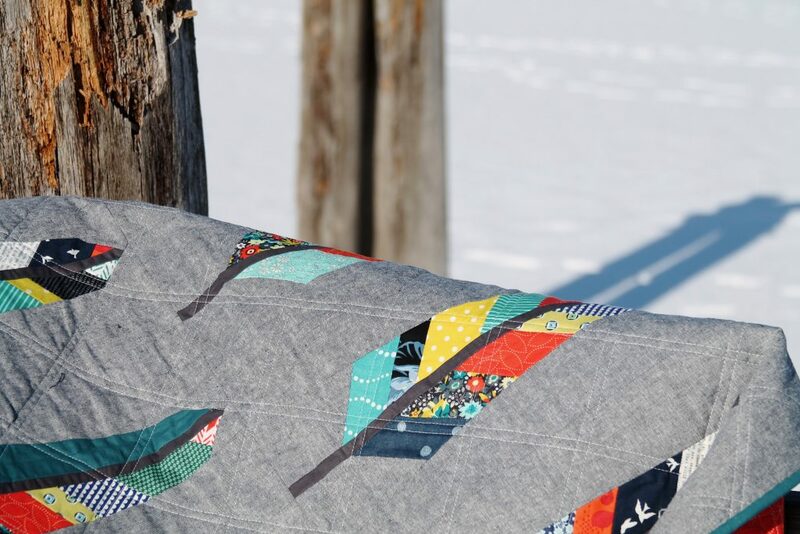 This entry was posted in Fabric, Finished Quilts, Posts about Quilts, Quilts and tagged anna maria horner, feather bed quilt, handmade, liberty of london, quilt. Bookmark the permalink. I thought there was such a thing as double needles which would give you what you wanted with one pass through! 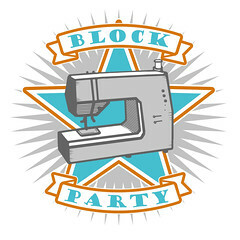 The double needle works great for hemming clothing and having that double stitch line, however, it doesn’t work for quilting as it doesn’t also produce the same double line for the backing. Gorgeous back drop – inspiring photos. 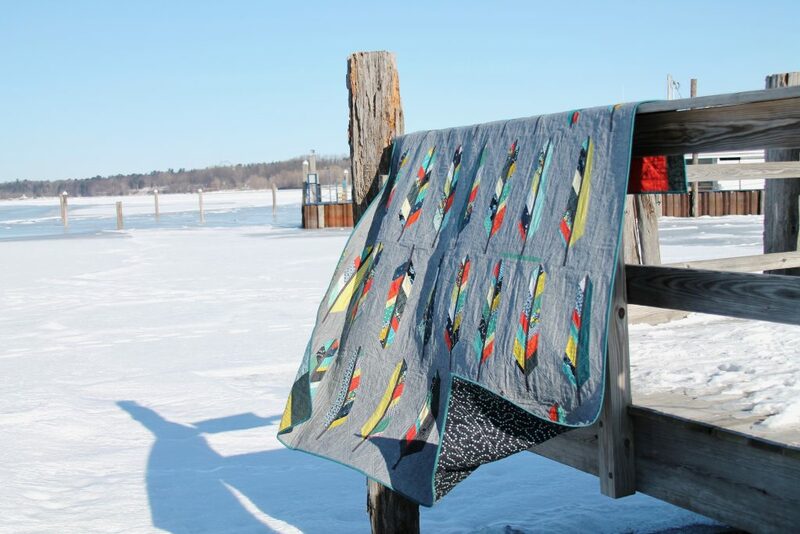 Love your Feather quilt. 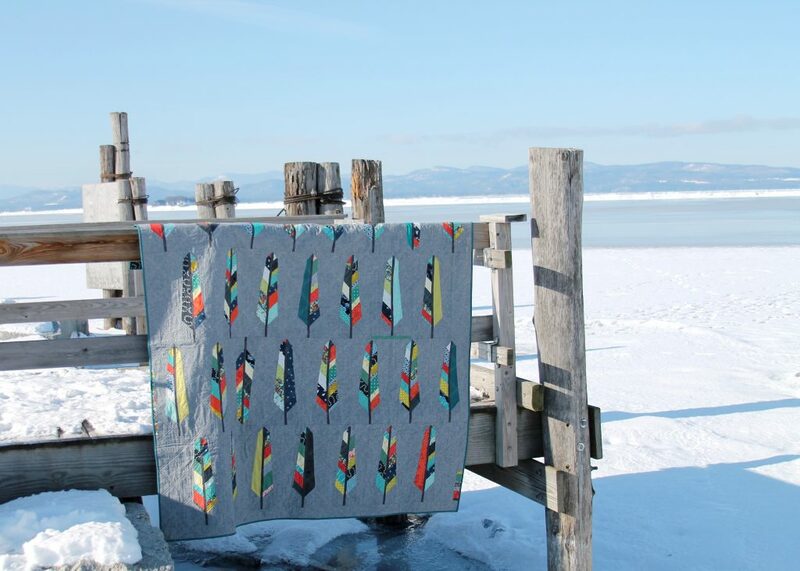 I have admired Anna Marie Horner’s quilt and pattern for many years but just haven’t gotten around to making one. Yours may be the inspiration that gets me started. Enjoy your posts immensely and thank you for continuing to blog. Reading through your first paragraph had me smiling, since I can relate to so much of it. I’ve been a lifelong procrastinator, stubborn about doing things my way, and I’ve learned lessons too. 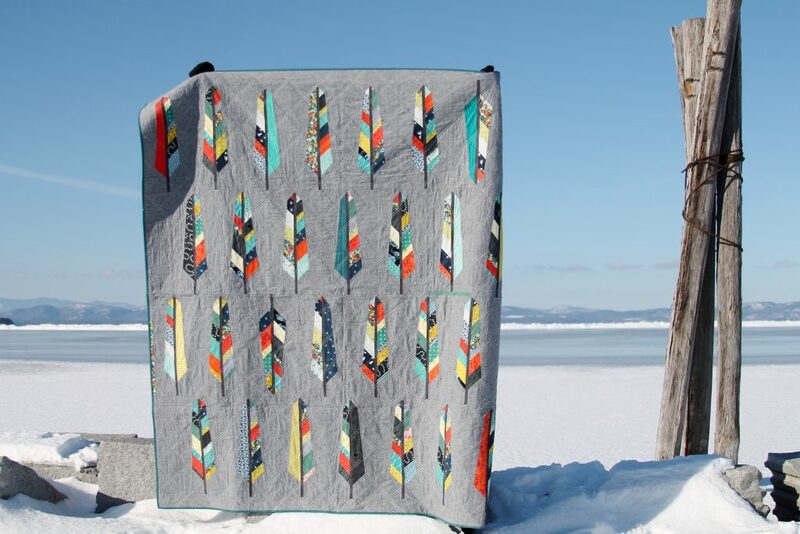 Your feather quilt is really pretty, and the backdrop for your photos is gorgeous. Could not relate to your first paragraph, hah! I like to follow patterns the first time, then the second go round I can do my own thing. I agree double line quilting is tedious. What a lovely finish! This pattern is on my extremely short patterns-to-make list, too. Also, in my mind the feathers are freeform to make, maybe that’s not how it’s written? Maybe someday I’ll find out. Anyhow, this is gorgeous, thanks for sharing! Way back in 2014! Oh, my. I really need to get some stuff done here if that is considered an older project. I am so toast! Ha, ha. This is a beautiful finish, and the ice background is perfect for it.